For many reasons, and I won’t bore you with the details, my original plan to have a 14-day Croatian adventure turned into only three days. I was in Dubrovnik five years ago, so my original thought was to spend my time sunbathing, reading, swimming and cliff diving. Good, old fashioned, rest and relaxation. But anyone who knows me well knows that I am incapable of relaxing. Katie Farrar put it best: “the only time you actually relax is when you sleep,” an observation made after living with me for a full year in San Francisco. True to form, instead of working on my tan, I filled my days with two day trips: one to the gorgeous Mljet Island National Park and the other to the war-torn city of Mostar in Bosnia. My evenings were spent wandering around Dubrovnik, which turned out to be the perfect time since the cruise ships take thousands of tourists back to sea around 5pm. At the end of each day, I found myself mentally, physically and emotionally exhausted. Dubrovnik and Mostar were both devastated in the early 90’s by the war following a declaration of independence from Yugoslavia. The stark contrast between these two cities post-war is mind-boggling and I have spent two weeks trying to make sense of it. 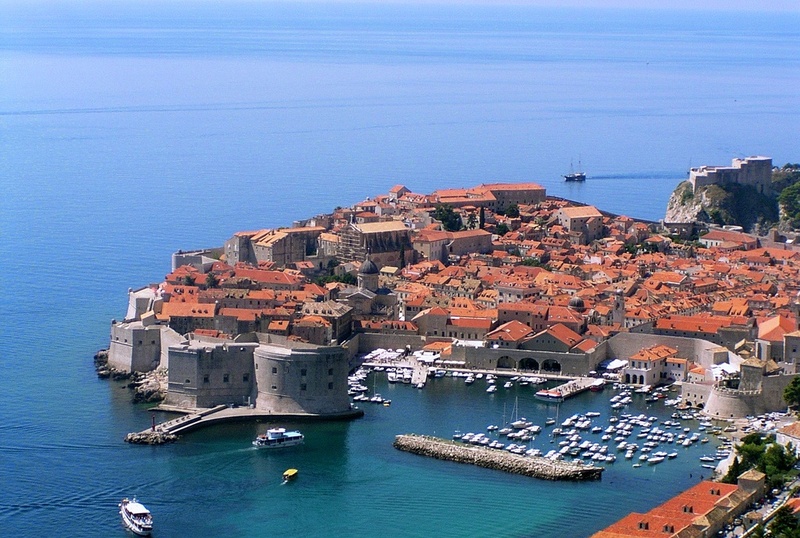 Considered to be the “Pearl of the Adriatic,” Dubrovnik rises proudly from the sparkling sea. 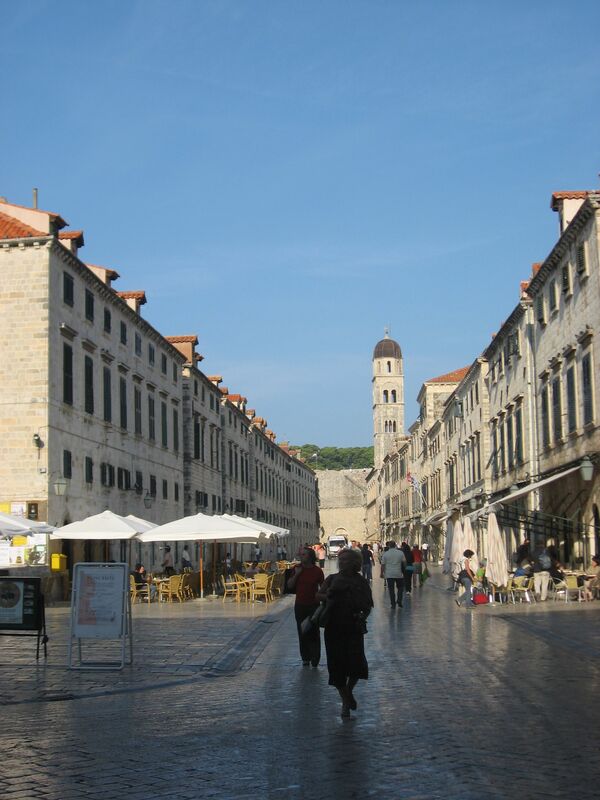 It is the largest city on the Dalmatian Coast and boasts a spectacular late-medieval wall which you can walk in its entirety. The old town is anything but old; it’s like the entire city was cleaned with a pressure washer. It is pristine, shiny and new with its white marble streets and gray stone buildings. There are souvenir shops on every corner, and street performers who dazzle you with their tricks, in exchange for a few Kuna coins of course. Small alleyways lined with cute hanging lanterns and signs advertising today’s lunch specials, it feels like Disneyland, the Happiest Place on Earth. It is only after a conversation with any of Dubrovnik’s residents, that you realize this is a superficial band-aid covering a gaping wound. At first glance, it is hard to believe that this city was torn apart by war. 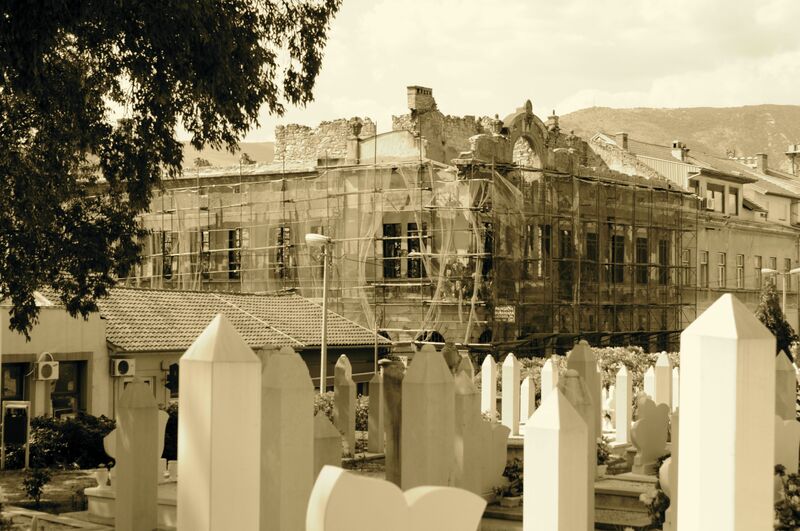 On the opposite end of this spectrum is Mostar in which very little has been repaired, rebuilt, or covered up. I would argue that Mostar rivals Dubrovnik in natural beauty with gorgeous mountains serving as a backdrop. The shockingly cold, emerald-green Neretva River cuts through the town, providing a geographic and symbolic divide between East and West. But the city itself still screams the echoes of the war, as if it were just yesterday; shrapnel and bullet holes scar the walls, over half the buildings on the main street are still bombed out. A downtown park was converted into a cemetery during the war because it was only here, under the protective shade of the trees, that people were able to bury their loved ones without being shot by a sniper. I have never seen war that up-close and personal, and it utterly silenced me. Since my return, I have tried again and again to sit down and put words to the roller coaster of emotions I felt during those sixty six hours. I failed. I simply cannot do it justice. What I will say is that I was ashamed at my ignorance. To be so blatantly unaware of such terrible ethnic genocide that occurred less than 20 years ago, to have no knowledge that this war was fought not between armies, but between neighbors in the same community and of the same ancestry…it made me sick. I will not attempt to write about the reasons for the war, nor will I choose a side. The history of the clashing cultures and religions is too complex to summarize, but I will continue to study this period in hopes of making some sense of it, if there is any to be made. I encourage you to do the same.